This month blog is by Professor Johan Schot for the Transformative Innovation Policy Consortium. The Sustainable Development Goals (SDGs) are the to-do list for the World. Encapsulate in 17 key points, they outline the major challenges faced by our Globe, its people and ecology. Unlike their predecessors the Millennium Development Goals (MDGs), the SDGs interweave and emphasis both social and environmental goals, as well as economic ones. They are unapologetically ambitious. Their unequivocal aim is to not leave any country, any region, or any person behind in the move towards equitable, sustainable growth for the 21st century. Countries have 12 years to fulfil this Agenda 2030 target. Yet, how the SDGs will be reached is still the big question of the day, the decade, and in all likelihood, the century. The TIPC approach demands that emphasis lays, not in the individual goals, but in the strapline ‘Transform our World’ (below). For this, we need an alteration of the systems that the goals exist within. This means the forms, ideas and paths that have been taken previously are changed to reach a new state of play. In 2015, the then United Nation Development Programme (UNDP) Director Helen Clark articulated that “transformation means that low carbon, climate resilient, green and inclusive economies and societies require fundamental changes in the way we live, work and do business” (UN, 2015). This stresses that for change we need system-level approach with Transformative Innovation Policies to help set it in motion. Due to the pressing need and timeframe, rapid transformative transitions are vital within each country and system context. As with all goal-setting, the SDGs represent both challenge and opportunity. 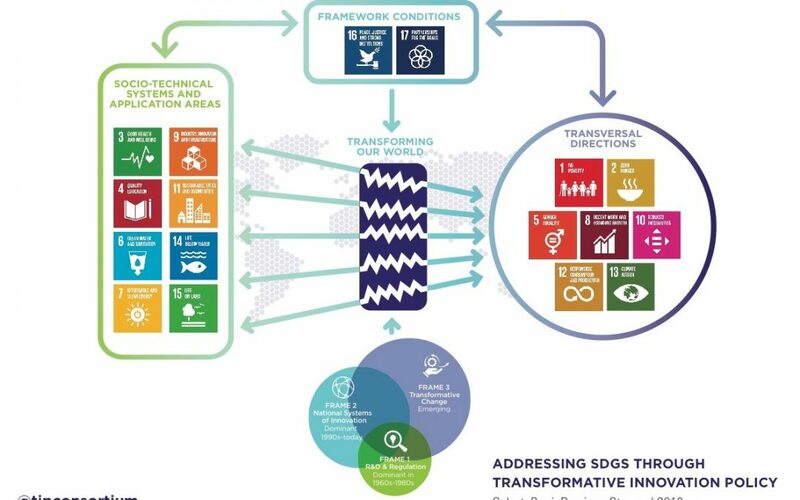 Like many actors concerned with sustainable progress, partners in the TIPC network are using the SDGs as a focal point through which to develop Transformative Innovation Policy and practice. Academics, governments and other actors are turning to the thinking outlined in Three Frames for Innovation Policy: R&D, Systems of Innovation and Transformative Change’ (Schot and Steinmueller, Research Policy forthcoming; published as working paper in 2016). First up in this argument, is the analysis and critique of business-as-usual formulations, measures and models. Embedded in the discourse of innovation frames 1 and 2, viewpoints around how innovation works are seen by many policymakers as no longer sufficient to answer the development demands of their nations. Many traditional approaches focus on technical aspects, neglecting the social and environmental dimensions. While targets and metrics may be a strength, often they promote oversimplification, supporting abstract, siloed approaches that fundamentally change nothing; serving only to ratify the incumbent systems, structures and behaviours. We don’t need a slightly adjusted normal, or even a new normal. We need a transformed normal. For those focused on finding ways to meet the SDGs, these emerging TIP ideas, methodologies and approaches help illuminate possible alternative paths and new directions. Both those to take, and those to close down. From difficulties with old concepts, innovations can spring. TIP invigorates opportunities for experimentation, upscaling, and building new commitments for transformative change. TIPC gives a cognitive and practical space to experiment, succeed, fail, learn, and reflect. Ultimately TIPC’s work aims to lead to fresh dynamics, and methods of approach, implementation and evaluation for STI. STI, then, that can meet the SDG targets in fresh, bold, sustainable ways. Agenda 2030 gives the chance to change the emphasis, governance and behaviour of systems, and the actors that inhabit them. The SDGs are an opportunity to create original and specific growth pathways that are inclusive. These new directions will alter the destructive dimension of current economies which deplete resources generating negative social, and political, consequences. In each specific context, the goals give the momentum and capacity to reframe what economic, social and environmental development is. They give the opportunity to rethink how we define progress. Those familiar with TIPC and the recently published paper on the Second Deep Transition (Schot and Kanger, 2018), will recognise that the TIPC work programme is approached from the viewpoint that each and every county in the world is actually developing. Thus, because no country has yet to achieve sustainable growth based on social inclusion and justice – we are all developing. TIPC’s philosophy and theory has a levelling quality for nations. There is a rejection of ideas of ‘developed’ and ‘developing’ countries. While each region and nation may face complex, specific situations as well as differing levels of economic wealth, none have broken through the old blueprint served up by the First Deep Transition – industrial modernity – to forge new sustainable, equitable systems of provision for their populations. That is the development challenge of the 21stCentury. A TIP perspective decouples the notion of the SDGs as being a tool just for the traditional aid sector and the overseas development departments of ‘developed’ donor governments concerned with assisting ‘developing’ countries. In its founding theory, TIPC’s work helps loosen neo-colonial mind-sets and the associated global power-relations to champion a new reading of what it means to be ‘developed’. Agenda 2030 and TIP need to work, as crucially, across the policy mix of economically wealthy governments as much as they do for the less wealthy nations. It is fundamentally crucial for the promotion of innovations in all areas from treasuries, to government departments in business, agriculture, education, transport, housing, health and security across the world. For richer or poorer, if you’re concerned with the Sustainable Development Goals, you’re concerned with transformation, and that means policy mixes that back-up changing the game, and its results. The TIPC interdisciplinary, inter-actor teams are building on work created in the TIPC exploratory year to establish a program of work with a focus on this new type of STI policy combining traditional and transformative methods in a promising mix. The aim is to help members be at the evolving edge of transformative STI policy, and New Economy thinking by placing STI front and centre in transformative ways in order to reach the SDGs. For a New Economy, fundamental change is needed, and STI can play an important role. The signing of the TIPC agreement is the recognition of this. 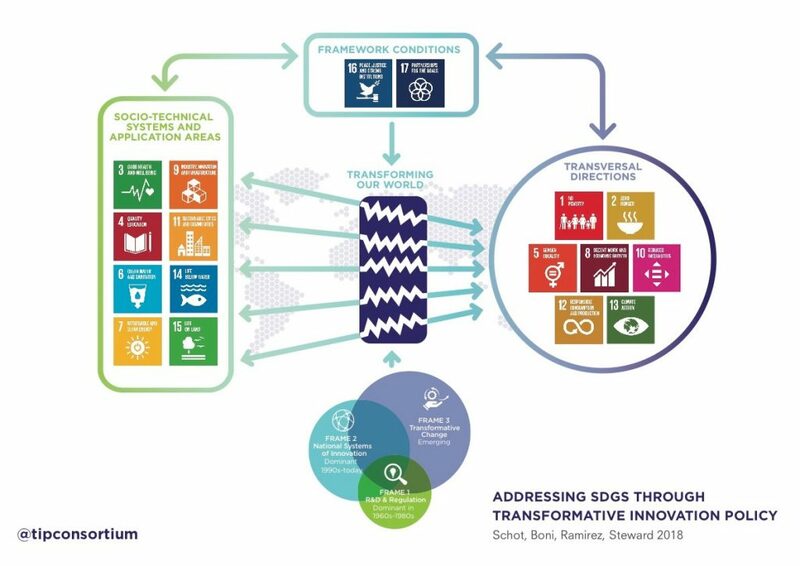 We have a new proposal – Addressing SDGs Through Transformative Innovation Policy (Schot, Boni, Ramirez, Steward, forthcoming, 2018) – for how the SDGs can be viewed from a Transformative Innovation Policy perspective. One which is different and complementary to the current ongoing processes led by the UN of mainstreaming SDGs into current policies. This process is driven by targets and indicators, not by the idea of transformation. From the latter perspective, three types of SDGs can be distinguished. Firstly, SDGs that refer to areas which require socio-technical system change. This can be energy or healthcare, but also more complex ones which refer to, for example, cities. This is a nexus for system change. Secondly, SDGs which refer to the ability of TIP to open-up radical alternatives that promise huge social and environmental benefits. They may provide systems with a different directionality. Thus, these are SDGs that orientate around transversal directions across systems, such as – no poverty, gender equality, climate action and decent work. Finally, there are goals which are framework conditions for realizing system change – peace, justice, strong institutions and effective partnerships for the SDGs. Often, these framework conditions are not fully in place, since current networks and institutions are not willing to open up for more radical, socio-technical system change. Hence, the framework conditions have to be co-produced in the process of system change, they are part of the development of a new economy and society in both the Global North and South. Both regions are expected to contributed to transformative change. It is clear that mutual policy learning, and the sharing of that experience will be a crucial success factor in addressing the UN Agenda 2030 call to ‘Transform our World’. For this to happen STI policy needs to re-invent itself too.